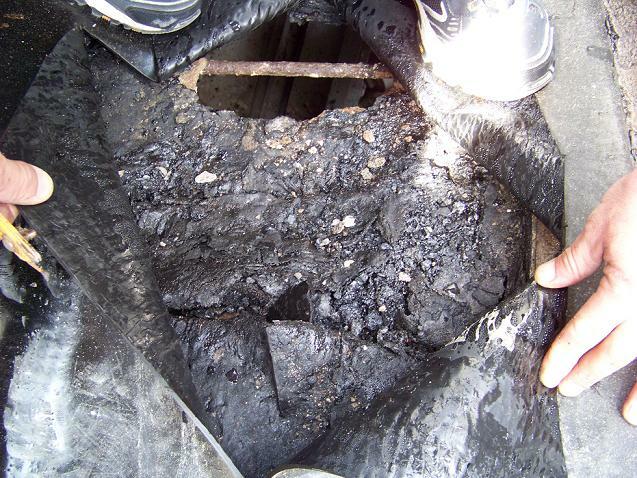 This is a picture of a section of roof membrane that has been pulled back to expose the damage below. This type of damage is indicative of intense moisture seepage over many years. The damage, which extends far below the surface of the roof, can cause extensive leaking within the building and, if not addressed, could eventually result in the roof collapsing. This type of problem can only be repaired by a complete demolition of the existing roof and the installation of a new roof. A smaller, less invasive and less costly repair is no longer an option. However, preventative maintenance or early detection could have helped to prevent the need for extensive roof repairs. Check the drains/gutters for trash or other debris. This is especially important before a big rainstorm. If you know there is a forcasted, try to have someone get onto the roof and make sure the drains/gutters aren’t clogged. This will decrease the likelihood of water ponding on the roof and the likelihood of water seepage into the roof membrane. After it rains, go onto the roof and look for any puddles. Keep a record of where they are, and check with the units below these areas to see if there is any sign of leaking. It could be that the ponding is nothing more than the result of a heavy rainfall, but if there is always a puddle in the same part of the roof, that area is more susceptible to water infiltration. Check for tears or cracks in the membrane. Take pictures of any damage, and measure how large it is. Keep track of the issue, and if it seems to be growing larger, consult with a contractor to see what can be done to fix it. Most roof repair estimates are free, and most reputable roofing companies will tell you whether or not you even need to repair the area. Keep an eye out for anything growing on the roof. Unless you have installed a green roof system, there shouldn’t be any weeds or plants growing out of the roof membrane. Plantlife means you have a water infiltration problem, and it may be time to contact a contractor. Check chimneys and parapet walls for damaged or deteriorated bricks or mortar. If there is deterioration, contact a contractor before the issue escalates or leads to unstable appurtenances. These are only a few of the things you should look for when maintaining a roof. Click here to download our Roof Maintenance Checklist. If you think your roof needs repair, and you would like Bellet Construction to perform a free estimate, click here or contact us at 212-982-3000.